This is the Tern Node D8 - a folding bike I got to try thanks to NYCeWheels. The picture above is how it looked the day I returned it. And the picture below is what it looked like the day I got it. See the 30+ year-old Return of the Jedi action figure in front? That's for scale. Now I own a Dahon Matrix, which has 26" wheels, so I'm no stranger to big folding bikes. The Tern features 24" wheels and I briefly thought I'd need an engine hoist to lift it out of the box. After some required assembly, the Tern Node D8 was sitting right there in my basement. This was my first exposure to a Tern and I had to say I was impressed out the gate. The hinges closed like the doors of a bank vault and the frame looked pleasantly overbuilt. The fenders, bell, and rear rack that came with it told me this bike is for commuting. The fold of this bike is intuitive. Even though it doesn't have a nice grippy feature on the bottom of the seat like a Brompton, I found I could carry it fairly easily by lifting part of the frame. I wouldn't be inclined to move it for long distances as it is, as I said, a large folding bike. As far as the ride goes, there's little I can tell you other than it's good. It doesn't feel at all like it is made for speed, but rather for every unfilled pothole, every seam in the concrete, every steel plate, every speed bump, every poor driveway cut and every other hazard found on city streets. The design seems to say: "you bought me to get you to work on time, and you are going to get to work on time." Therein lies the tradeoff of the large wheels: the bike may be a little less portable, but you won't react to unavoidable potholes the way the crew of the Starship Enterprise reacted to incoming photon torpedoes. However, as I found in the course of my testing, the bike's size when folded is small enough to fit on Metro North. If you find a car with the fold-down seats, it can sit right beside you and not bother any of the passengers who need the aisle. When sitting beside it, the Node D8 seat also made for a comfortable armrest. Additionally, this folding bike passed a little-known test on this commute to Manhattan: If a bike can be completely ignored by any and all Metro North employees during peak hour trains but draw admiring comments from attractive professional women, the bike is a winner. And I have to say the Node D8 really did come alive in the city. As I said, it's not a fast bike and the rides I did in early mornings in Stamford, far from traffic, might have made the bike feel slower than it actually is. But in New York City, it behaves like it's made for all of this. So if you're looking for a folding bike and you use the word 'rugged' when you describe to the staff at NYCeWheels or another local bike shop, the Node D8 by Tern may be the right choice. 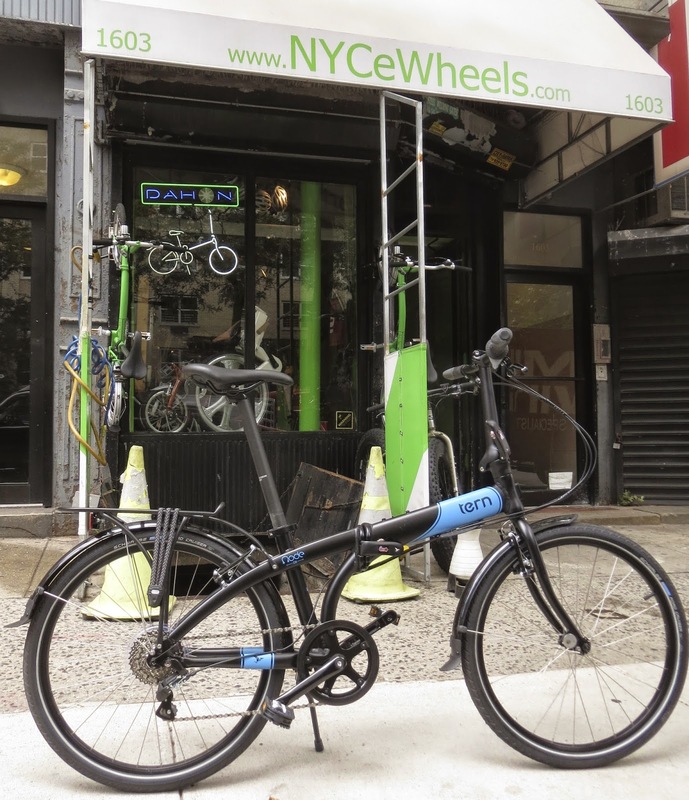 And if you want to know more about my time with the Tern, please see the posts I made for NYCeWheels. 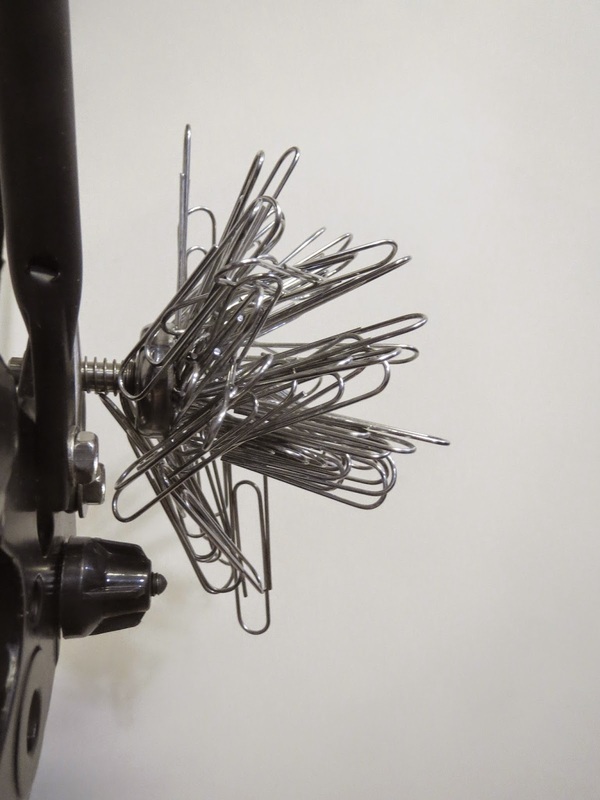 *Or however many paper clips are in the picture.